Prompt delivery of large quantities of high-quality, human-created training data for the optimization of your speech recognition systems. 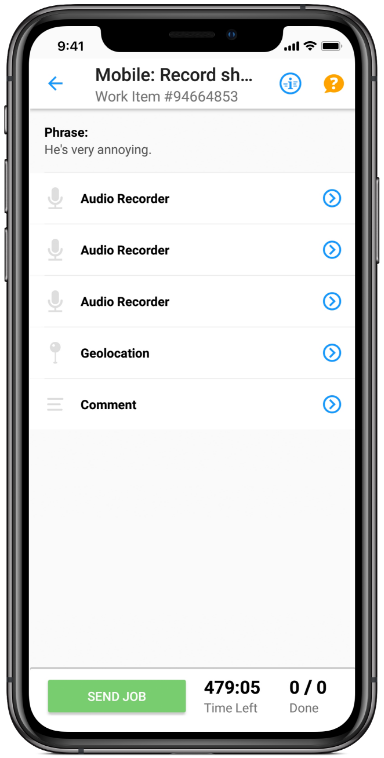 More than 1.5 million Clickworkers from all over the world create specific voice recordings (text to speech), transcribe voice recordings (speech to text) and classify audio files according to your specifications – in more than 30 languages and numerous dialects. Each human voice and speech pattern is unique. They differ in intonation, speed, and pronunciation, as well as in elements of dialect. These factors complicate the development of automated speech recognition systems. A good speech recognition system must be trained with a vast number of high-quality speech recordings provided by various people in order to cover the range of human language nuances and, as such, be capable of performing the correct actions. how clearly sentences are comprehended when they are said by people of divers origins and with different background noises. High-performance speech recognition systems that convert authentic language into text require extensive man-made training data for machine learning. With the help of our international crowd, we provide voice recordings and also transcribe audio files in numerous languages. The transcriptions are only processed by qualified Clickworkers, carried out precisely and checked before being accepted. These high-quality training data enable your speech recognition system to continue learning, and to achieve optimal results. 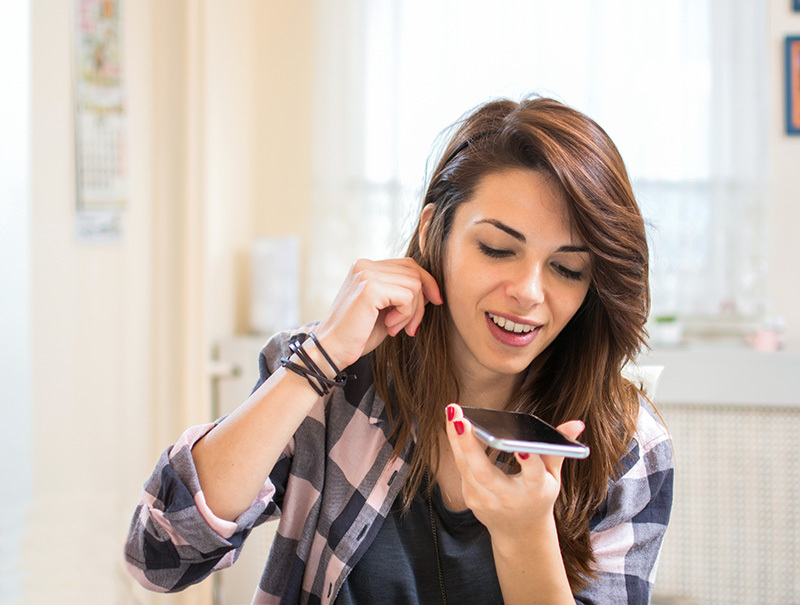 Speech recognition systems that are meant to learn how to communicate and perform actions must be able to correctly interpret, assess and place the spoken word in the appropriate context. 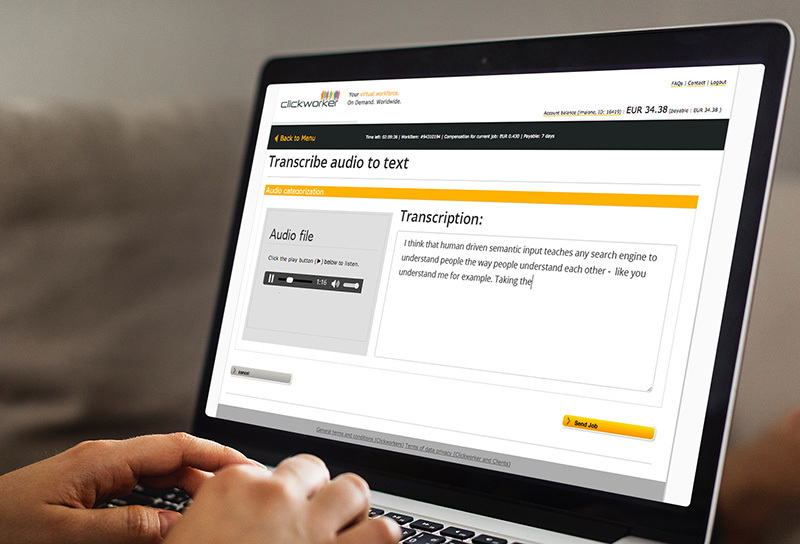 Our Clickworkers can filter out this information from audio files and make them available as training data for your speech recognition system. Analyses can include, for instance, the emotional tonality as well as the subject matter of the spoken text in addition to the quality of the audio file (with regard to clear sound, articulation and correctness of the voice commands). 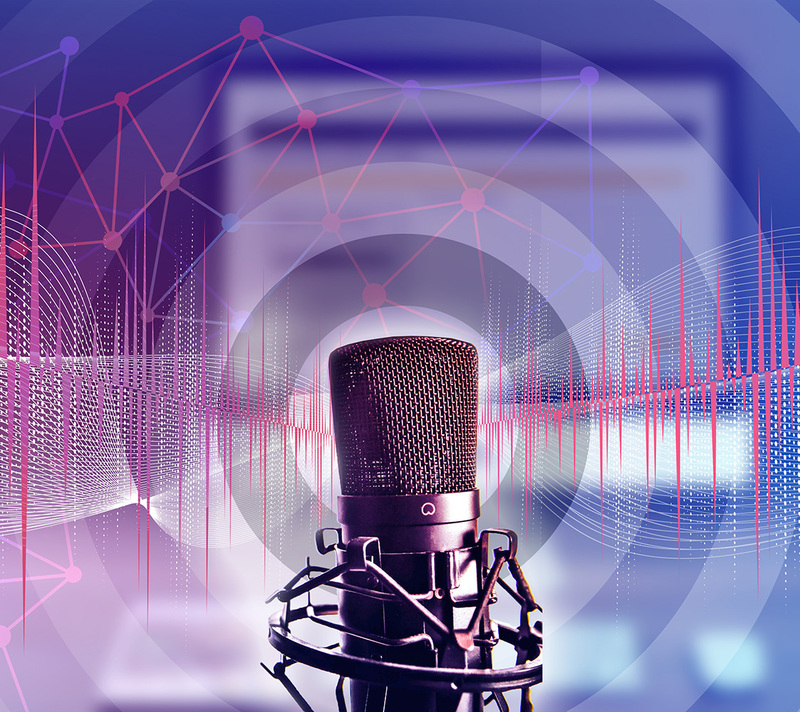 The analysis of this data provides your system with first-rate audio data sets as well as more detailed content-related information about the audio files – for optimized use in human interaction. 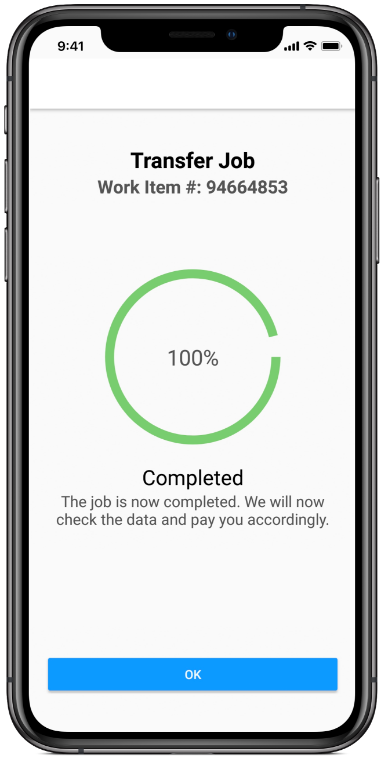 With the Clickworker App (for Android and IOS), Clickworkers can create audio data sets and transfer to you from anywhere. All of the tasks involved in the creation of your audio files can be set up to meet your exact specifications. You can define the length of the audio, the number of audios and their format. We can also deliver the geodata of every audio file. Your personal consultant from our team will discuss the objectives of the project with you. Based on this information, our qualified project managers will set up the tasks according to your specifications. Only qualified Clickworkers will be authorized to work on your project. If desired, special task training as a prerequisite for working on your project can also be set up. 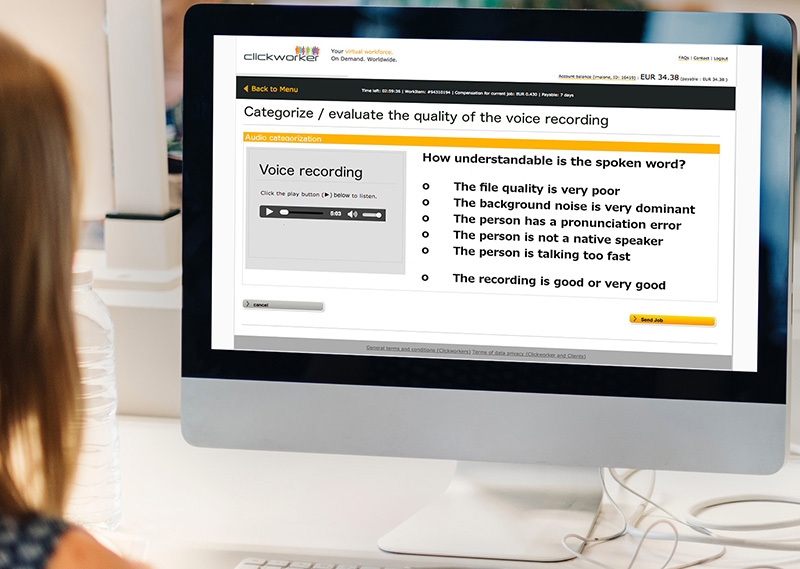 All of the audio files created by our Clickworkers, as well as the transcriptions and assessments, will be subject to a final check, so that you will only receive high-quality audio data sets for training your speech recognition systems. This service provides a large quantity of high-quality training data for your computer vision models in a very short space of time. Our Clickworkers mark image elements with bounding boxes, polygons or key points, use pixel-accurate semantic segmentations and label or tag the markings. This service provides you with video data sets created by our worldwide-based team of Clickworkers according to your exact specifications. Depending on the model used to train your AI system, Clickworkers can create videos of themselves, of motion sequences, of nearby objects, of pets, etc. With this service, you can order AI training data in the form of numerous photographs, which our Clickworkers create to meet the specific requirements of your training objectives. 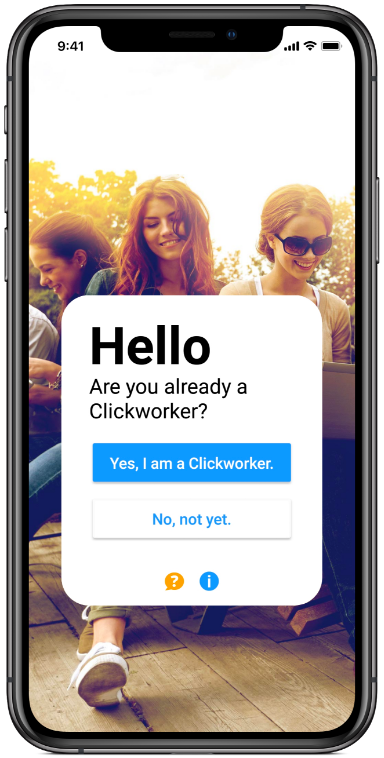 Our Clickworkers can make selfies for training facial recognition and recognition of emotions, as well as photographs of nearby objects, places of interest, traffic situations, animals, etc. for training image recognition systems.